In professional sports it's not unusual for commentators to refer to highly-skilled athletes who are stellar in multiple roles as a triple threat. The same can be said of artists and others in the creative arena. Take Sarah Leavens, for example, who earned her MFA in Poetry & Creative Nonfiction as a fellowship winner and her BFA in Oil Painting. In 2012-2013, she was selected as the Out of the Forge Writer-in-Residence in Braddock, Pennsylvania. To her talents in and passion for visual arts and creative writing, add teaching. With a background in public arts initiatives and outreach, Sarah currently teaches visual art and writing at the Pittsburgh Center for the Arts, and is a part-time instructor in the English Department at the University of Pittsburgh (Pitt). Among her other accomplishments: Sarah's work has appeared in several literary journals, and she has exhibited her original visual works of art steadily since 2004. She is also the recipient of several awards, residencies and other fellowships for writing, and was recently nominated for a Pushcart Prize. Blast Furnace caught up recently with the prolific artist/writer/teacher at a coffee shop near Pitt to discuss one of her passions: book making. Following is our interview with Sarah, along with photographs of some of her original hand-made books courtesy of the artist. 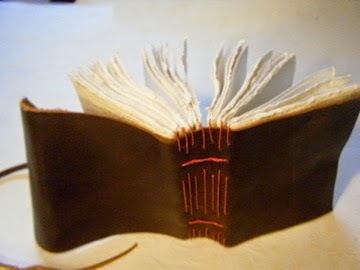 How did you become interested in book making? Did you create other types of artwork before? I was always doing writing or art in equal parts. I’ve tried to balance those two interests since I was little, and then all through high school. My last semester as an undergrad—which was five years for me pursuing a Bachelor of Fine Arts in painting and a Bachelor of Arts in Writing—I had an [extracurricular] class and chose book making. The University of Georgia’s art school offered a travel-abroad art focus and I enrolled in it as a kind of independent study. It was the perfect marriage of my interests, the perfect way to work with my hands and by far my favorite class. I was obsessive about it, too, and had an incredible instructor, Shanna Leino. 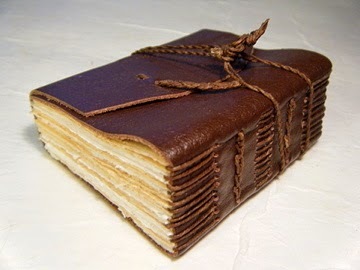 She was really inspiring and used beautiful paper and leather to make books. In class [which was in Cortona, Italy], we learned to make our own paper and dry it on the line. It was romantic, in a romantic place, and I was completely hooked. I didn’t merge the first book that I made with writing, and didn’t explore making a book as a piece of writing until three or four years later. My soundtrack while I was there was Led Zeppelin’s House of the Holy, ('The Rain Song,' 'Over the Hills and Far Away'), which just happened to be the music on the computer I used at the school’s tiny computer lab. 'Houses of the Holy' also became the title of my lyric essay, which I made into a book. What was your project theme? I was super into the lyric essay, and wove lyrics from those songs, but particularly 'The Song Remains the Same,' and a few biblical things, and also wove through it a sense of space and holy spaces. There was a holy energy everywhere there, a [tangible] sense of time in that place. I could walk the real Roman road there. The hilltop village of Cortona was surrounded by an Etruscan wall made of stone that was first built around 600 B.C. [I had] an art history project to research the churches of the town. The whole town existed according to the location of the sun. High Catholicism had a large presence there, too. St. Francis of Assisi lived for a time in a nearby monastery, Le Celle. There was lots of interplay between the natural and holy world. Each town [in Italy] has a patron saint, so there is a presence of a holy aspect [for that reason]. They actually display the saint’s bodies above ground there, most of the time in glass cases. At the same time, I was doing lots of sketching in a journal and painting projects defined by the class syllabus, in addition to writing an essay about holy and mystical spaces. I learned how to make a wood book using an African form of binding known as Coptic, and created a book as my final project using European hardwood. For the paper, I gathered sticks, leaves and nuts from the hillsides, made dyes, and dyed the paper. For the inside covers I carved out an altar space and made smaller books to fit inside of it. The [end result] was a larger book that came about four years later. 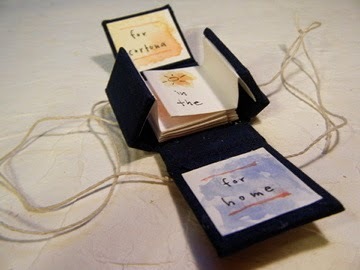 An alter book made to fit specifically the 'Houses of the Holy' essay. 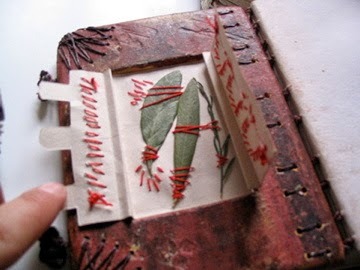 I made a wooden book in Cortona and smaller books I made fit inside it. It was all based on the idea of preserving the holy, and I used vellum overlays on pages to keep the precious preserved. What are some of the specific steps involved for you in creating these books? First, establish the purpose of the book, which then determines the form or structure, which then often dictates the materials to use, what the cover and insides are going to be: hard/soft; thick/little; thin/large. And will there be any extras, like pockets? And what will be on the cover? What will I use for the text block (the paper that fills the book)? Once all of that is planned or started, then Independently I sew the bindings. I decide whether to hide the binding, or show it, because some are ornamental. My default is the softcover journal with a long-stich spine. Talk about your work with the Pittsburgh Center for the Arts. What inspires you to create your art? Do you find the inspiration for each of your artistic interests often occurs simultaneously? It can be specific locations. Music. Stress! Diverting stress through creative projects. I find that I almost never have free time anymore to create. Sometimes, I’m inspired from seeing other people’s work. Like Anne Carson, an incredible writer of densely lyrical pieces and intensely lyrical novels and a Greek scholar. She created the book, 'Nox,' which means “night” in Latin. The pages of her book come out in an accordion. I still have not figured out how to balance it all. Painting. Visual art. Writing. Talk about any of your current book-making projects. 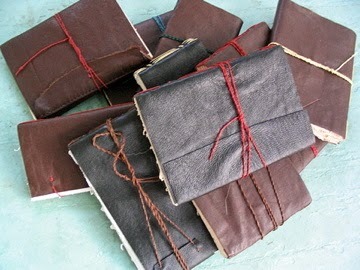 I agreed to sell hand-made journals that are blank inside to a local bookstore. The covers are from reclaimed leather from the Pittsburgh Center for Creative Reuse [in Point Breeze]. I used to go to Goodwill for old leather [coats] that I would cut apart. The insides are lined with decorative paper; some are graph paper and some are blank pages. Additionally, some of the books I made are on display in the bookstore but aren't for sale.